Last week it came for a brief moment, but was carried off in the wind. Early this morning, long before my eyes opened, my ears could hear the chirping of cold baby birds. Their beaks are probably skyward, open wide and hungry for food. From a distance, I’ve been keeping my eye on a nest of 2 baby birds who seem to have a very absent mommy. Once up, I opened the shutters and was greeted was beautiful, graceful, snowflakes. In my mind I picture . . . Snowflakes trickle down the tiny throats of those hungry babies, relieving their thirst. This just might have to do for now. I wonder if they would like a few bites of Carrot cake? Even though it doesn’t look like spring outside my window, there are certainly signs of it everywhere you look in Idaho. Park yourself on a park bench for about 20 minutes, and you’ll see it. Just sit still and people watch. The wind is howling, it’s still 30 degrees outside . . .but crop, capris and wedges have suddenly sprung! The same thing takes place in the fall when it’s say 70 degrees. Suddenly you see winter coats and boots, along with beads of perspiration trickling down foreheads as if they’ve been struck with an unusual fever. We are such an impatient people. Myself included. Easter has sprung a bit earlier as well. What’s up with that? Would it be too much to ask for a bit of warm weather when we wear sandals and short sleeve dresses? Just saying . . . 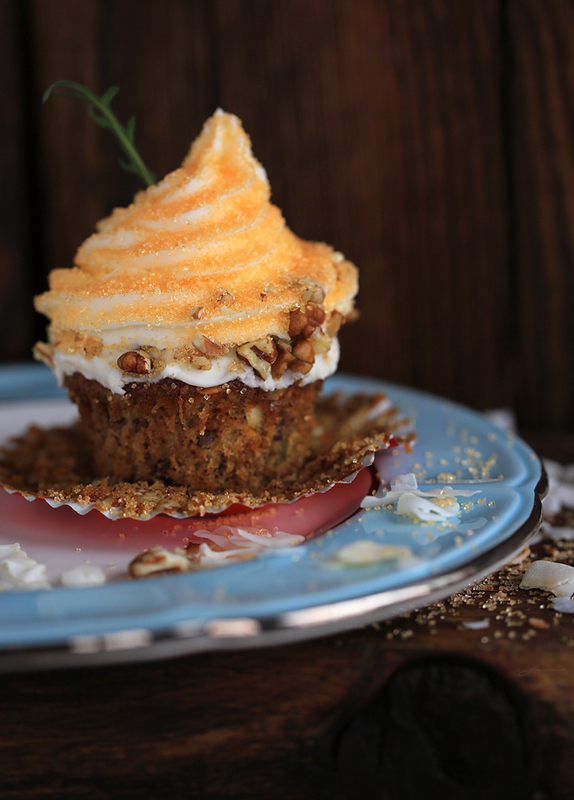 These Carrot cupcakes have been a work in progress. I bought a new square cupcake pan and some square cupcake liners. To make a long story short, the liners didn’t seem to fit the square holes very well. It’s a good thing that I made a pan of good old fashioned round cupcakes as well. They are the only ones worthy of a picture. The Carrot cake recipe is from the new Taste of Home magazine that came in my mailbox this week. For those of you who might have it as well, it’s Mrs. Thompson’s Carrot Cake and it won her 1st place. My sweet half really likes Carrot Cake, so I figured why not try it. My additions were: golden raisins, coconut, pecans, nutmeg and a touch of cloves. The cake is moist and I believe a keeper. The frosting is perfect . . . according to me. 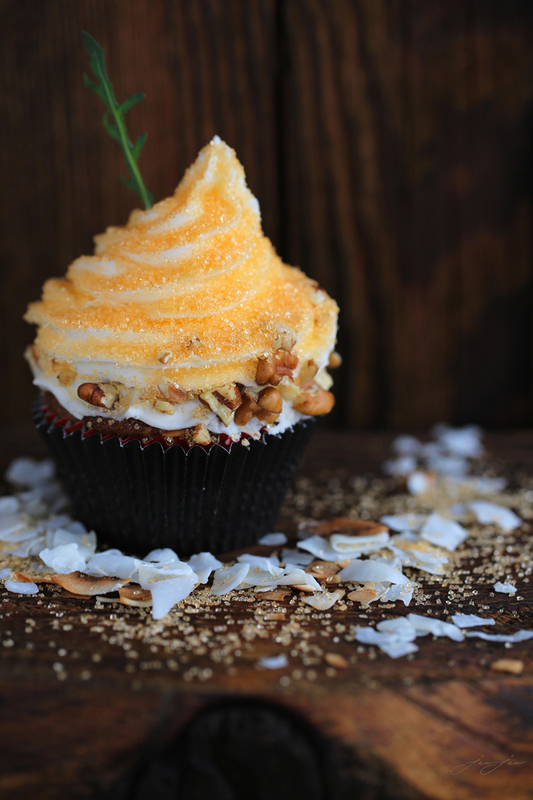 In the pic above, I used a 1M tip to pipe the Cream cheese frosting, added some bright orange crystal sprinkles and chopped pecans. According to my husband . . . leave the cupcakes plain, then they are perfect! 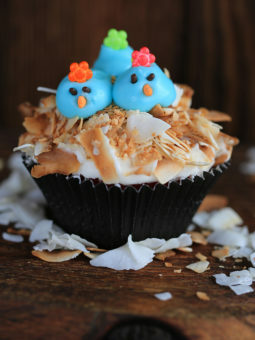 I couldn’t resist making Nesting Baby Bluebird Cupcakes inspired by Martha Stewarts Cookbook: Martha Stewarts Cupcakes. Her cupcakes use a yellow cake, but I just used the carrot cake cupcakes. 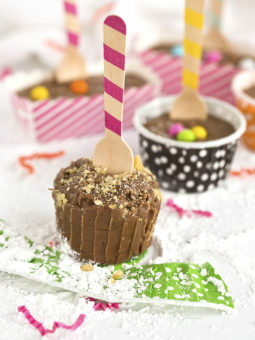 Start by frosting the tops of the cupcake with a smooth layer of buttercream or Cream cheese frosting. Toast some large flake or shredded coconut for the nest. You can find this really large flake coconut at health food stores. 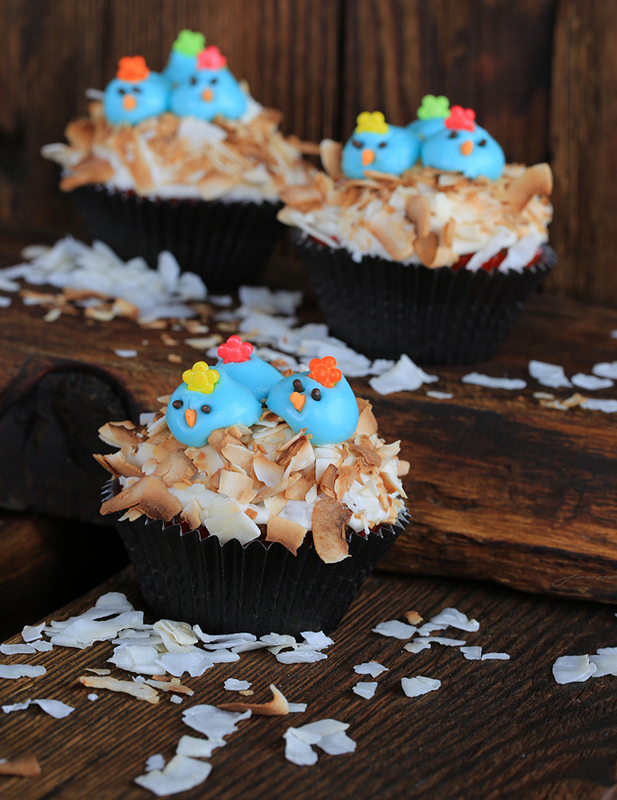 Form a nest by patting coconut into the frosting around the edges of the cupcake. For the baby birds, I just tinted some of the Cream Cheese Frosting with blue gel color. Transfer the frosting to a pastry bag fitted with a 1A tip. Pipe 3 small blue mounds for the bluebird heads onto each cupcake. I chose to bling the baby birds with simple sprinkles I found in my pantry. They are dressed for Easter. If you decide NOT to dress the birds for Easter, you can leave the orange beaks off. Just pretend the the Orange beaks are gone in the picture below. Add little yellow sprinkles, or pipe yellow beaks onto the tops of the birds, and place the eyes below. This will makes the birds appear to have their beaks open and up in the air waiting for food. (It’s hard to tell, unless you can picture the orange beaks gone. I knew if I removed them, that the heads would be muffed up.) Hopefully you get the picture. For now, I’m going outside to give those babies some carrot cake! In a large bowl, beat the first five ingredients until well blended. In another bowl, mix the flour, baking soda, cinnamon, nutmeg, cloves; gradually beat into carrot mixture. Optional: Add raisins and coconut, mix well. Transfer mixture to a greased 13×9 ” baking pan or will make approximately 24 cupcakes. Use liners or grease well. Cake:Bake at 350 degrees for 35 to 40 minutes or until a toothpick inserted in center comes out clean. 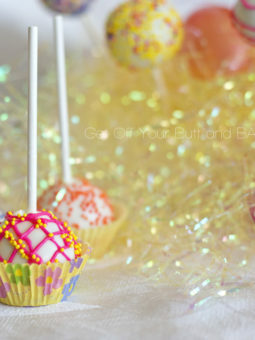 Cupcakes: Bake at 350 degrees for 15 to 20 minutes or until a toothpick inserted in center comes out clean. Cool completely in pan on a wire rack. I remove cupcakes and let them cool in liners on wire rack. In a large bowl, beat the cream cheese, butter and vanilla until blended. Gradually beat in confectioners sugar until smooth. Thanks for always leaving me sweetness!